Driving with correctly inflated and legal tyres is crucial when hitting the road, either for the daily commute or when going on holiday. This week’s “Getting to Know” guide looks at the role of the tyre pressure monitoring system (TPMS) and how it works. As of November 2014, all new passenger cars sold in the European Union must be equipped with a TPMS. What is a tyre pressure monitoring system (TPMS)? The Tyre Pressure Monitoring System (TPMS) is an automatic monitoring system designed to monitor the pressure of tyres in order to alert the driver if there is under-inflation and a compromise of their safety. Poorly inflated tyres are prone to blow outs and may make it more difficult to brake or steer the car. Also, according to Continental, if a car’s tyres are under-inflated by just 0.3 bar, the vehicle is likely to consume 1.5% more fuel and produce a higher level of CO2 emissions. What are the different types of TPMS? gauge the rate of revolution each wheel is making – it doesn’t actually measure the pressure. Based on the rate of revolution of each wheel, the computer can interpret the relative size of the tyres on the vehicle. When a wheel starts spinning faster than expected, the computer calculates that the tyre is under-inflated and alerts the driver accordingly. The advantage of such a system is that it’s relatively inexpensive compared to a direct TPMS, but on the other hand, may prove unreliable when tyres are unevenly worn. Direct – gives a far more accurate reading than an indirect system as it uses pressure monitoring sensors within each tyre rather than wheel revolution data. Information from each sensor, which also have a unique serial number to distinguish themselves between those on the other tyres, is sent to a centralised control module where it’s analysed, and if the pressure is lower than the recommended level, an indicator light will illuminate on the dashboard. How is a driver alerted if one or more of the tyres are under-inflated? 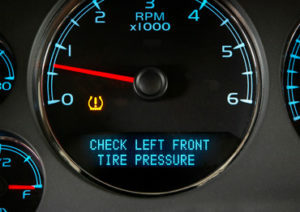 The TPMS low tyre pressure indicator is a yellow symbol that illuminates on the car’s dashboard in the shape of a tyre cross-section (that resembles a horseshoe) with an exclamation point. Where can I find a garage to get my TPMS looked at or replaced? To find your local Motor Ombudsman-accredited franchised car dealership or independent garage to get your tyre pressure monitoring system looked at or replaced, visit The Motor Ombudsman’s online Garage Finder.